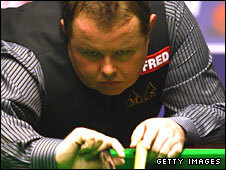 Snooker player Stephen Lee has been bailed following an investigation into suspicious betting patterns. West Midlands Police confirmed the player, from Trowbridge, Wiltshire, and ranked number 25 in the world, was arrested on Thursday. Mr Lee's agents On Q Promotions said he denied any involvement in cheating or betting irregularities. West Midlands Police said the arrest followed a joint operation with the Gambling Commission over concerns about betting patterns and Mr Lee was released on bail on Friday afternoon. His management said he was not expecting to be charged. A statement from On Q Promotions, Mr Lee's management company, said: "Stephen Lee was taken to a West Midlands Police station for questioning on Thursday, February 11. "Stephen co-operated fully with the police inquiry and was released without charge. "He does not expect any charge to be made and denies any involvement with cheating or betting irregularities. "Stephen is now concentrating on practising hard to achieve qualification for the World Championship and to fulfil all of his exhibition commitments." The father-of-four was once ranked fifth in the world. World Snooker, the commercial arm of governing body the World Professional Billiards and Snooker Association (WPBSA), said it was awaiting further developments. "We are aware of the recent news articles concerning match fixing and are awaiting further reports," a statement said. "In instances where the Gambling Commission commences an investigation into a match, the WPBSA works together with the commission to assist in its inquiries and the WPBSA will hold its own investigation open pending the conclusion. "However, neither the commission nor the WPBSA will release information surrounding a betting matter while an investigation in ongoing."